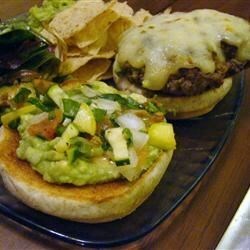 "A Cheeseburger with a Southwestern citrus twist"
To make the guacamole, mash the avocado in a medium bowl with the juice of half a lime, jalapeno, tomatoes, 1/4 cup onion, and 1 1/2 teaspoons of minced garlic; season to taste with salt, and set aside. In a large bowl, mix together beef, the juice of half a lime, 1 tablespoon garlic, chili powder, 1/2 cup diced onion, and cilantro. Form the meat into 6 patties. Cook the burgers to desired doneness on the preheated grill. Add a slice of cheese to each burger during the last minute of cooking. Serve on toasted buns with a dollop of guacamole. Tender shredded chicken makes a 5-star filling for tacos and enchiladas. These were great! Burgers were very juicy. Didn't change a thing.